This week's FREE FICTION FRIDAY brings you a new adventure of Fendreg the Senagran, the warrior who first appeared in "The Fall Of The Witch-King." I hope you enjoy today's tale. The night was smeared red with firelight. 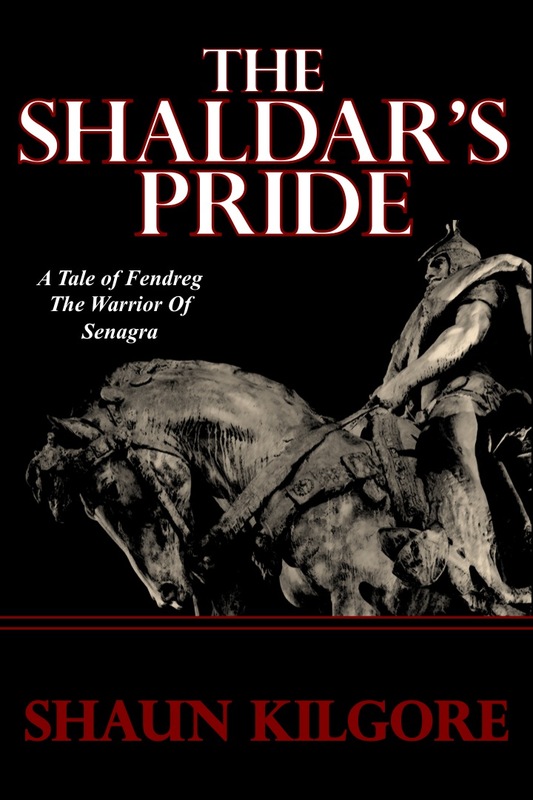 Below in the canyon, Fendreg estimated there were twenty thousand of the Shaldar's soldiers. He had come forward to scout the encampment and to gauge the enemy's strength. Despite the cloud-choked skies, the numerous fires illuminated the camp very well. Fendreg's keen eyes could make out the movements of the patrols; he could see the Shaldar's enormous black tent posted near the center of the sprawling encampment. Sliding back down the slope he met up with the other outriders, Corba and Zene. The two men were shrouded in the murky night, but Fendreg, aided by his enchanted gaden-armor, could see their distinctive Kelvana dress, the long braided hair, the thin moustaches that drooped down their cheeks, and the knee-high boots they tucked their striped trousers into. They were horsemen through and through, more at home in their saddles than on the solid ground. Both were trusted scouts of the Kelvana chieftain, Rulrick. Fendreg had banded with the tribe after the Shaldar's horde burned a Kelvana settlement to the ground. The men and boys had been slain, women raped and murdered, the younger girls taken as slaves. Fendreg had been traversing the Kelvana lands and found the settlement just after the Shaldar left it; he had rushed into the burning huts and rescued Rulrick's father, the former chieftain. The gnarled old man was barely alive. He was the only survivor of the carnage. Once the old man, Junar, had been reunited with the rest of the tribe, Rulrick declared before all that the Kelvana people were in his debt. Fendreg chose to stay and help them drive the Shaldar and his thousands from the plains. "What did you see?" asked Corba. "The Shaldar has many warriors, many horses, and more than enough steel. We must speak with Rulrick." "But how many, Lord Fendreg?" asked Zene. His voice still had a boy's squeak. He was barely seventeen years old. Fendreg's expression was grim; neither could see him in the darkness. "At least twenty thousand." Fendreg moved to take the reins of his own brown stallion, Artress. The warhorse snorted and tried to nick his gauntlet. Once astride the beast, he spurred into motion. The Kelvana followed close behind trusting Fendreg to lead them down the right path. All of the Kelvana horsemen knew something of the powers granted by the gaden-armor—that with it he could see in the dark as well as a mountain cat. The path was little more than a narrow trail that left the top of the ridge and angled downhill until it met the thin ribbon of water known as the Cormand. The terrain was rugged and dry with the summer heat. The rocks of the high country quickly gave way to the brittle grass of the plains. Down along the banks of the Cormand, Fendreg heeled Artress long enough for the animal to drink. Corba and Zene were there too, watering their horses. Both refreshed their water horns. Fendreg had barely touched his since they left the previous day. Once they were ready, he led them parallel to the Cormand until he found a place to ford the small river. The water level was much lower due to the lack of rain, barely reaching the bellies of the horses. After they crossed, Fendreg led them up and away from the low-lying riverbed, and emerged up on the unbroken vistas of the plains—Themadra's Plains, so the Kelvana called them. They were adherents the goddess' religion and just another offshoot of the cults that dotted the broad expanses of the plains from the Dark Mountains to the Broken Sea. Out in the open, the horsemen let their horses rush forward, trusting in the familiar terrain as well as the keen eyes of the outsider to lead them home safely. For a time, the only sounds were the steady pounding of hooves on the ground and the deep breaths of the horses. Fendreg bent low in the saddle, leaning forward to urge more speed from Artress. Corba and Zene followed only a pace behind. They were in their element. For what seemed like hours, they rode across the open plains, not pausing even when the first glimmers of sunlight spilled over the edge of the horizon. They were riding directly east, right into the reddish-golden blaze. The sun rose as a swollen and angry orb, pouring out heat to dispel the chill of night. In time, the party slowed to rest their mounts. They were ten miles or more from the Shaldar's encampment. Fendreg's eyes were the first to sight the red banners of the Kelvana camps. The crimson cloth drooped against the stake, bereft of even a breeze to display the single eye, the mark of Rulrick's clan. Fendreg and the others carried on at an easy trot. He noted when the guards posted out away from the main camp noticed their approach. Word was spreading now. A half an hour's ride later, they entered the camp amidst of flurry of questions and wolfish gazes. The Kelvana were ready to seek their revenge. Fendreg knew it was his job to temper their rage so they would not be cut down in droves. The Shaldar's men were ruthless and well trained. They would need good planning on their side if they wanted to drive the horde off the plains. Fendreg slowed further until heeling Artress to a halt before the chieftain. Rulrick was a broad-shouldered man. His long-braided hair was touched with streaks of gray, his moustaches reached the middle of his chest, and he wore a wicked curved blade at his hip. His face seemed to be chiseled from stone.